TASMANIA, the beautiful island state of Australia exhibits many unique features, one of which is the Tasmanian Devil. This “Award” is named after it. To qualify for the award it is necessary to make contact with a certain number of Tasmanian amateurs, dependant upon your own location as indicated below. Contact to be made with 20 VK7 stations with at least one contact made in each of the Southern, Northern and North Western areas. Satellite contacts via amateur satellites with cross band to HF allowed if licence conditions allow. Contact to be made with 30 VK7 stations by any amateur using the IRLP system whether within Australia or overseas. each claim for the award is to be accompanied by AUD $5.00 or equivalent in IRC’s to cover the cost of the Award and postage. All contacts made since 1 January 1978 are allowed for this award. The Award measures 205 mm by 230 mm, printed on pale light blue card with a map of Tasmania in green in the centre. 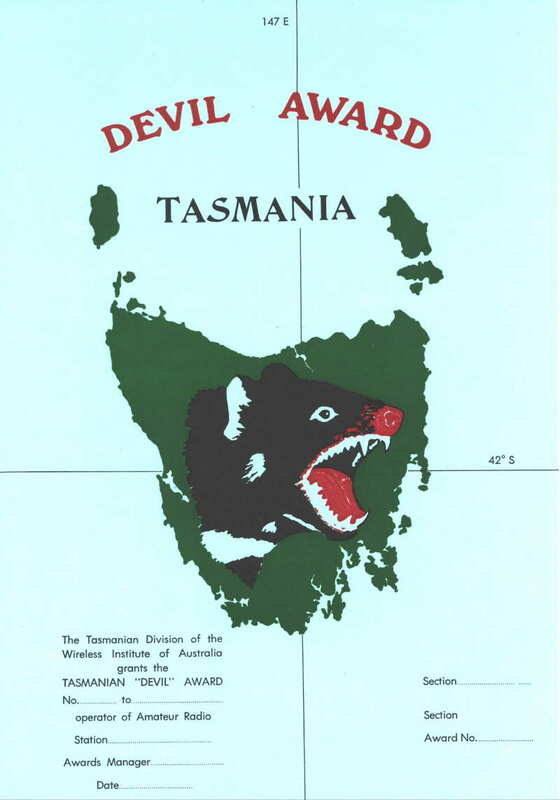 The head of aTasmanian Devil, in black with a red nose and mouth is printed within the map of Tasmania. Amateurs holding the “TASMANIAN DEVIL AWARD” are reminded that upgrades are available for the award. Presently held are 150, 200, 250 and 300 upgrades. If you qualify for any of the these upgrades, please forward a copy of your logs as outlined above and an upgrade sticker will be forwarded.